A a physicist, I do a lot of writing and public speaking about the remarkable nature of our cosmos, primarily because I think science is a key part of our cultural heritage and needs to be shared more broadly. Sometimes, I refer to the fact that religion and science are often in conflict; from time to time, I ridicule religious dogma. When I do, I sometimes get accused in public of being a “militant atheist.” Even a surprising number of my colleagues politely ask if it wouldn’t be better to avoid alienating religious people. Shouldn’t we respect religious sensibilities, masking potential conflicts and building common ground with religious groups so as to create a better, more equitable world? I found myself thinking about those questions this week as I followed the story of Kim Davis, the country clerk in Kentucky who directly disobeyed a federal judge’s order to issue marriage licenses to gay couples, and, as a result, was jailed for contempt of court. (She was released earlier today.) Davis’s supporters, including the Kentucky senator and Presidential candidate Rand Paul, are protesting what they believe to be an affront to her religious freedom. It is “absurd to put someone in jail for exercising their religious liberties,” Paul said, on CNN. The Kim Davis story raises a basic question: To what extent should we allow people to break the law if their religious views are in conflict with it? It’s possible to take that question to an extreme that even Senator Paul might find absurd: imagine, for example, a jihadist whose interpretation of the Koran suggested that he should be allowed to behead infidels and apostates. Should he be allowed to break the law? Or—to consider a less extreme case—imagine an Islamic-fundamentalist county clerk who would not let unmarried men and women enter the courthouse together, or grant marriage licenses to unveiled women. For Rand Paul, what separates these cases from Kim Davis’s? The biggest difference, I suspect, is that Senator Paul agrees with Kim Davis’s religious views but disagrees with those of the hypothetical Islamic fundamentalist. The problem, obviously, is that what is sacred to one person can be meaningless (or repugnant) to another. That’s one of the reasons why a modern secular society generally legislates against actions, not ideas. No idea or belief should be illegal; conversely, no idea should be so sacred that it legally justifies actions that would otherwise be illegal. Davis is free to believe whatever she wants, just as the jihadist is free to believe whatever he wants; in both cases, the law constrains not what they believe but what they do. In recent years, this territory has grown murkier. Under the banner of religious freedom, individuals, states, and even—in the case of Hobby Lobby—corporations have been arguing that they should be exempt from the law on religious grounds. (The laws from which they wish to claim exemption do not focus on religion; instead, they have to do with social issues, such as abortion and gay marriage.) The government has a compelling interest in insuring that all citizens are treated equally. But “religious freedom” advocates argue that religious ideals should be elevated above all others as a rationale for action. In a secular society, this is inappropriate. The Kim Davis controversy exists because, as a culture, we have elevated respect for religious sensibilities to an inappropriate level that makes society less free, not more. Religious liberty should mean that no set of religious ideals are treated differently from other ideals. Laws should not be enacted whose sole purpose is to denigrate them, but, by the same token, the law shouldn’t elevate them, either. In science, of course, the very word “sacred” is profane. No ideas, religious or otherwise, get a free pass. The notion that some idea or concept is beyond question or attack is anathema to the entire scientific undertaking. This commitment to open questioning is deeply tied to the fact that science is an atheistic enterprise. “My practice as a scientist is atheistic,” the biologist J.B.S. Haldane wrote, in 1934. “That is to say, when I set up an experiment I assume that no god, angel, or devil is going to interfere with its course and this assumption has been justified by such success as I have achieved in my professional career.” It’s ironic, really, that so many people are fixated on the relationship between science and religion: basically, there isn’t one. In my more than thirty years as a practicing physicist, I have never heard the word “God” mentioned in a scientific meeting. Belief or nonbelief in God is irrelevant to our understanding of the workings of nature—just as it’s irrelevant to the question of whether or not citizens are obligated to follow the law. Because science holds that no idea is sacred, it’s inevitable that it draws people away from religion. The more we learn about the workings of the universe, the more purposeless it seems. Scientists have an obligation not to lie about the natural world. Even so, to avoid offense, they sometimes misleadingly imply that today’s discoveries exist in easy harmony with preëxisting religious doctrines, or remain silent rather than pointing out contradictions between science and religious doctrine. It’s a strange inconsistency, since scientists often happily disagree with other kinds of beliefs. Astronomers have no problem ridiculing the claims of astrologists, even though a significant fraction of the public believes these claims. Doctors have no problem condemning the actions of anti-vaccine activists who endanger children. And yet, for reasons of decorum, many scientists worry that ridiculing certain religious claims alienates the public from science. When they do so, they are being condescending at best and hypocritical at worst. This reticence can have significant consequences. Consider the example of Planned Parenthood. Lawmakers are calling for a government shutdown unless federal funds for Planned Parenthood are stripped from spending bills for the fiscal year starting October 1st. Why? Because Planned Parenthood provides fetal tissue samples from abortions to scientific researchers hoping to cure diseases, from Alzheimer’s to cancer. (Storing and safeguarding that tissue requires resources, and Planned Parenthood charges researchers for the costs.) It’s clear that many of the people protesting Planned Parenthood are opposed to abortion on religious grounds and are, to varying degrees, anti-science. Should this cause scientists to clam up at the risk of further offending or alienating them? Or should we speak out loudly to point out that, independent of one’s beliefs about what is sacred, this tissue would otherwise be thrown away , even though it could help improve and save lives? Ultimately, when we hesitate to openly question beliefs because we don’t want to risk offense, questioning itself becomes taboo. It is here that the imperative for scientists to speak out seems to me to be most urgent. As a result of speaking out on issues of science and religion, I have heard from many young people about the shame and ostracism they experience after merely questioning their family’s faith. Sometimes, they find themselves denied rights and privileges because their actions confront the faith of others. Scientists need to be prepared to demonstrate by example that questioning perceived truth, especially “sacred truth,” is an essential part of living in a free country. I see a direct link, in short, between the ethics that guide science and those that guide civic life. Cosmology, my specialty, may appear to be far removed from Kim Davis’s refusal to grant marriage licenses to gay couples, but in fact the same values apply in both realms. Whenever scientific claims are presented as unquestionable, they undermine science. Similarly, when religious actions or claims about sanctity can be made with impunity in our society, we undermine the very basis of modern secular democracy. We owe it to ourselves and to our children not to give a free pass to governments—totalitarian, theocratic, or democratic—that endorse, encourage, enforce, or otherwise legitimize the suppression of open questioning in order to protect ideas that are considered “sacred.” Five hundred years of science have liberated humanity from the shackles of enforced ignorance. We should celebrate this openly and enthusiastically, regardless of whom it may offend. If that is what causes someone to be called a militant atheist, then no scientist should be ashamed of the label. This map highlights a patch of sky that was thought to show the most ancient light in the universe, but is now thought to be dust. Scientists will have to wait a while longer to find out what kicked off the Big Bang. Last spring, a team of astronomers who go by the name of Bicep announced that they had detected ripples in space-time, or gravitational waves, reverberating from the first trillionth of a trillionth of a trillionth of a second of time — long-sought evidence that the expansion of the universe had started out with a giant whoosh called inflation. The discovery was heralded as potentially the greatest of the new century, but after months of spirited debate, the group conceded that the result could have been caused by interstellar dust, a notion buttressed by subsequent measurements by the European Space Agency’s Planck satellite that the part of the sky Bicep examined was in fact dusty. Now a new analysis, undertaken jointly by the Bicep group and the Planck group, has confirmed that the Bicep signal was mostly, if not all, stardust, and that there is no convincing evidence of the gravitational waves. No evidence of inflation. “This analysis shows that the amount of gravitational waves can probably be no more than about half the observed signal,” Clem Pryke of the University of Minnesota said Friday in an interview. When the galactic dust is correctly subtracted, the scientists said, there was indeed a small excess signal — a glimmer of hope for inflation fans? — but it was too small to tell if it was because of gravitational waves or just experimental noise. The Bicep/Planck analysis was led by Dr. Pryke, one of the four Bicep principal investigators. Brendan Crill, of the California Institute of Technology and a member of Planck, acted as a liaison between the groups. They had planned to post their paper Monday, but the data was posted early, apparently by accident. It was soon taken down, but not before it set off an outburst of Twitter messages and hasty news releases. A paper is to be posted to the Bicep website and has been submitted to the journal Physical Review Letters. But it will be far from the final word. A flotilla of experiments devoted to the cause are underway, studying a thin haze of microwaves, known as cosmic background radiation, left from the Big Bang, when the cosmos was about 380,000 years old. Among them is a sister experiment to Bicep called Spider, led by Bill Jones of Princeton and involving a balloon-borne telescope that just completed a trip around Antarctica, as well as Bicep’s own Keck Array and the recently installed Bicep3. At stake is an idea that has galvanized cosmologists since Alan Guth of the Massachusetts Institute of Technology invented it in 1979. Inflation theory holds that the universe had a violent and brief surge of expansion in the earliest moments, driven by a mysterious force field that exerted negative gravity. It would explain such things as why the universe looks so uniform and where galaxies come from — quantum dents in the inflating cosmos. Such an explosion would have left faint corkscrew swirls, known technically as B-modes, in the pattern of polarization of the microwaves. So, however, does interstellar dust. The Bicep group — its name is an acronym for Background Imaging of Cosmic Extragalactic Polarization — is led by John M. Kovac of the Harvard-Smithsonian Center for Astrophysics; Jamie Bock of Caltech; Dr. Pryke; and Chao-Lin Kuo of Stanford. They have deployed a series of radio telescopes at the South Pole in search of the swirl pattern. Their second scope, Bicep2, detected a signal whose strength was in the sweet spot for some of the most popular models of inflation, leading to a sensational news conference attended by Dr. Guth and Andrei Linde, two of the founding fathers of inflation. But that was before critics raised the dust question. Moreover, that result was contrary to a previous limit on the strength of gravitational waves obtained by the Planck satellite, which has scanned the entire microwave sky in search of the Big Bang’s secrets. Planck observed the microwaves in nine frequencies, making it easy to distinguish dust. 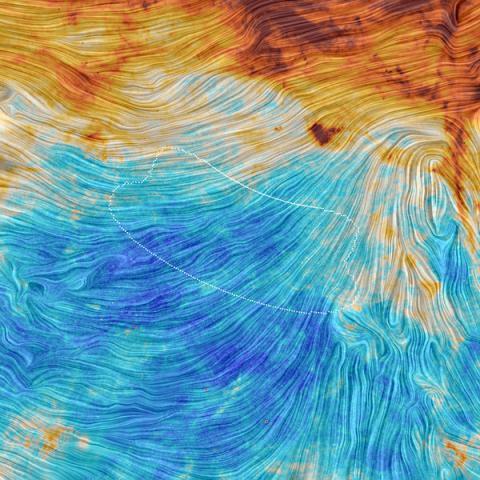 Bicep2 had only one frequency and lacked access to Planck’s data until last fall, when the two groups agreed to work together. In an email, Paul J. Steinhardt, a Princeton cosmologist who was a founder of inflation but turned against it in favor of his own theory of a cyclic bouncing universe, said the new results left cosmologists back where they were before Bicep. But Dr. Linde noted that there was evidence in the new analysis for a gravitational wave signal, albeit at a level significantly lower than Bicep had reported. “This is what all of us realized almost a year ago, and it did not change,” he said in an email. The earlier Planck result limiting gravitational waves, he said, had inspired a firestorm of theorizing, in which he and others produced a whole new class of theories relating not just to inflation, but to dark energy as well. “So yes, we are very excited, and no, the theory did not become more contrived,” he said. Max Tegmark, an M.I.T. expert on the cosmic microwaves, said, “It’s important to remember that inflation is still alive and well, and that many of the simplest models predict signals just below this new limit.” The next few years will be interesting, he said. Michael Turner, a cosmologist at the University of Chicago, said he could appreciate the frustration of his colleagues, who have been wandering in the wilderness for nearly four decades looking for clues to the Beginning. Last week I spent an enjoyable few days in Tenerife, one of the Canary Islands, for a conference on the Philosophy of Cosmology. The slides for all the talks are now online; videos aren’t up yet, but I understand they are forthcoming. 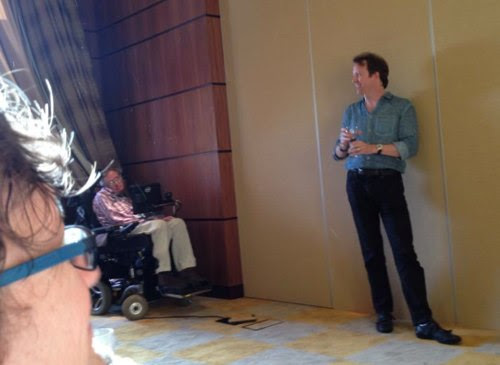 Stephen Hawking did not actually attend our meeting — he was at the hotel for a different event. But he stopped by for an informal session on the arrow of time. Photo by Vishnya Maudlin. It was a thought-provoking meeting, but one of my thoughts was: “We don’t really have a well-defined field called Philosophy of Cosmology.” At least, not yet. Talks were given by philosophers and by cosmologists; the philosophers generally gave good talks on the philosophy of physics, while some of the cosmologists gave solid-but-standard talks on cosmology. Some of the other cosmologists tried their hand at philosophy, and I thought those were generally less successful. Which is to be expected — it’s a sign that we need to do more work to set the foundations for this new subdiscipline. A big part of defining an area of study is deciding on a set of questions that we all agree are worth thinking about. As a tiny step in that direction, here is my attempt to highlight ten questions — and various sub-questions — that naturally fall under the rubric of Philosophy of Cosmology. They fall under other rubrics as well, of course, as well as featuring significant overlap with each other. So there’s a certain amount of arbitrariness here — suggestions for improvements are welcome. In what sense, if any, is the universe fine-tuned? When can we say that physical parameters (cosmological constant, scale of electroweak symmetry breaking) or initial conditions are “unnatural”? What sets the appropriate measure with respect to which we judge naturalness of physical and cosmological parameters? Is there an explanation for cosmological coincidences such as the approximate equality between the density of matter and vacuum energy? Does inflation solve these problems, or exacerbate them? What conclusions should we draw from the existence of fine-tuning? How is the arrow of time related to the special state of the early universe? What is the best way to formulate the past hypothesis (the early universe was in a low entropy state) and the statistical postulate (uniform distribution within macrostates)? Can the early state be explained as a generic feature of dynamical processes, or is it associated with a specific quantum state of the universe, or should it be understood as a separate law of nature? In what way, if any, does the special early state help explain the temporal asymmetries of memory, causality, and quantum measurement? What is the proper role of the anthropic principle? Can anthropic reasoning be used to make reliable predictions? How do we define the appropriate reference class of observers? Given such a class, is there any reason to think of ourselves as “typical” within it? Does the prediction of freak observers (Boltzmann Brains) count as evidence against a cosmological scenario? What part should unobservable realms play in cosmological models? Does cosmic evolution naturally generate pocket universes, baby universes, or many branches of the wave function? Are other “universes” part of science if they can never be observed? How do we evaluate such models, and does the traditional process of scientific theory choice need to be adapted to account for non-falsifiable predictions? How confident can we ever be in early-universe scenarios such as inflation? What is the quantum state of the universe, and how does it evolve? Is there a unique prescription for calculating the wave function of the universe? Under what conditions are different parts of the quantum state “real,” in the sense that observers within them should be counted? What aspects of cosmology depend on competing formulations of quantum mechanics (Everett, dynamical collapse, hidden variables, etc.)? Do quantum fluctuations happen in equilibrium? What role does decoherence play in cosmic evolution? How does do quantum and classical probabilities arise in cosmological predictions? What defines classical histories within the quantum state? Are space and time emergent or fundamental? Is quantum gravity a theory of quantized spacetime, or is spacetime only an approximation valid in a certain regime? What are the fundamental degrees of freedom? Is there a well-defined Hilbert space for the universe, and what is its dimensionality? Is time evolution fundamental, or does time emerge from correlations within a static state? What is the role of infinity in cosmology? Can the universe be infinitely big? Are the fundamental laws ultimate discrete? Can there be an essential difference between “infinite” and “really big”? Can the arrow of time be explained if the universe has an infinite amount of room in which to evolve? Are there preferred ways to compare infinitely big subsets of an infinite space of states? Can the universe have a beginning, or can it be eternal? Does a universe with a first moment require a cause or deeper explanation? Are there reasons why there is something rather than nothing? Can the universe be cyclic, with a consistent arrow of time? Could it be eternal and statistically symmetric around some moment of lowest entropy? How do physical laws and causality apply to the universe as a whole? Can laws be said to change or evolve? Does the universe as a whole maximize some interesting quantity such as simplicity, goodness, interestingness, or fecundity? Should laws be understood as governing/generative entities, or are they just a convenient way to compactly represent a large number of facts? Is the universe complete in itself, or does it require external factors to sustain it? Do the laws of physics require ultimate explanations, or can they simply be? How do complex structures and order come into existence and evolve? Is complexity a transient phenomenon that depends on entropy generation? Are there general principles governing physical, biological, and psychological complexity? Is the appearance of life likely or inevitable? Does consciousness play a central role in accounting for the universe? Chances are very small that anyone else interested in the field, forced at gunpoint to pick the ten biggest questions, would choose exactly these ten. Such are the wild and wooly early days of any field, when the frontier is unexplored and the conventional wisdom has yet to be settled. Feel free to make suggestions. Andrew Jones: So, the Origins Project just literally had its fifth anniversary. Lawrence Krauss: Yes, on Saturday [April 5, 2014]. AJ: I’ve seen some of the videos from it. You guys (sic) host the Great Debates. LK: Yes, we just had a Great Debate with 3,000 people on Saturday. AJ: What I really like about the work I see coming out of there is that it’s a very interdisciplinary look at origins. LK: Everything from the origins of the universe to the origins of consciousness, so it’s about as interdisciplinary as you can get. We call it transdisciplinary. That’s the buzzword at ASU [Arizona State University]. But we try to bring together people from vastly different fields to look at forefront questions and look at them in different ways and see which questions we can make progress in. And these questions, since they’re foundational, are often of interest to the public, so we often have a public event associated with them. AJ: Obviously, you got into that through cosmology and the origins of the universe, but what made you decide you wanted to make that the origins of everything? LK: Well, actually, I began to think about this back when I lived here in this state of Ohio, but as I was thinking of ways to get people interested in the subject, I realized that cosmology, as exciting as it is, alone is just part of the question and that one could bring together lots of different fields and when I started to think about it, I realized that origins questions are really at the heart of the forefront of science. And, as you may or may not know, I have a broad interest in science, well beyond physics, and so I just thought: Well, since origins questions are at the forefront of science, and they are also at the forefront of the public’s interest, it would be a wonderful handle to allow us to look at really interesting questions anywhere, they all fit in an origins framework. And it would allow us to do just what we’ve done, to bring together people from different fields and it’s been incredibly successful. It was ambitious and I think a lot of people thought it wouldn’t work, but it did. AJ: Yes, I wish something like that had been in place when I’d graduated. I have an undergraduate degree in physics. And, in addition to just being kind of tired of 16 years of college [I meant school], I also kind of got the sense there wasn’t much left to do, because at the time they were writing books like The End of Physics and so on. LK: Yeah, I know, and that’s an unfortunate thing. AJ: So if something like this had been there to make it clear how many good, rich questions there were still. LK: Exactly! We tend to treat physics for kids as if it was done 200 years ago by dead, white men, but that’s just not it, though. The questions are vibrant and they’re of interest and they’re accessible to people, which is one of the reasons that I write and speak about them. Yeah, it’s unfortunate the way that we turn people off by doing that. And ASU, when the President of the university invited me to come, they were particularly attracted by this idea of interdisciplinary. I am part of a school of Earth and Space Exploration that has astronomers, astrophysics, geophysicists, planetary scientists, engineers, all in one place looking at these things. An example of the kind of interdisciplinary work we’re doing. AJ: … of everything. And one thing I know you’ve answered in previous interviews, and I think in The Atlantic interview you really clarified this point, but so just since I have you here, I’ll just double check that my understanding is correct. The book, as I read it, is not saying that this is definitely what happened, it’s saying that we have an explanation of what could have happened. Is that a fair statement? LK: We have a plausible explanation of what could have happened. More importantly, if you asked “What would be the characteristics of a universe created by nothing ... created from nothing by known laws of physics?” our universe has precisely those characteristics. Now does that prove it happened? No, because we don’t have a theory of quantum gravity, but it’s plausible. It’s become a lot more plausible in the last few weeks, with the discoveries from the cosmic microwave background and the gravitational radiation, which in principle take us back and directly allow us to measure what happened in the first 10-35 seconds of the big bang. But it was just that: This is plausible. And just having a plausible explanation is remarkable. Just like when Darwin developed the theory of evolution, he was plausible. He didn’t have all the data. He had fossil ideas and he had data suggesting this idea worked, and actually compellingly suggesting that it worked, but he didn’t know about DNA or the genetic basis of life and now we do, but at the time it was a plausible argument. AJ: One of the things that I really like about things you’ve said repeatedly about science is about being honest about how we look at questions and not assuming we have the answer before we start. LK: No, I think that’s … I mean, we teach kids as if the answers are important. It’s the questions that are important. And I think that not knowing is a wonderful thing and more parents and more teachers should be willing to say that. “I don’t know the answer. Let’s figure out how we might learn what the answer is.” Because that’s what we’re trying to teach in schools. It’s a process. Science is a process of trying to take this complicated world and figure things out and that means not knowing things and try to figure out how to get the answer. And not knowing is what I do for a living. LK: Yeah, they know they’re right, which means they don’t know anything. AJ: But, I loved the honesty about, “We tried this. It didn’t work.” And scientists embrace that, because it leads us forward. AJ: That wasn’t really a question. LK: No, I think honesty is a key part of science. Honesty and full disclosure. I like to try and think I do that, take that beyond science. But being wrong is a central part of science and being willing to say you’re wrong. In fact, Woody Allen says in our movie, too, he talks about it. I think the point is that’s how we make progress. I have had, I think, many beautiful ideas and unfortunately nature wasn’t smart enough to adopt them. AJ: So, I have a couple of questions that are related to again kind of the questions of origins. I was wondering of one thing. In the past, you have expressed … I’m not sure if skepticism is quite the right word, but not exactly being “on board” with string theory as enthusiastically as some people are. Is that still kind of a fair assessment? Or was that ever really fair? Because it’s hard to get a clear handle on it. Or does that fall in the “we don’t know” category? LK: I wrote a book, called Hiding in the Mirror, which I called a “fair and balanced look at string theory,” in the non-FOX News sense. My point was that string theory is based on a lot of fascinating ideas. However, it has been the least successful great idea in science in the sense that it hasn’t yet made touch with observation in any way. We still don’t know if the ideas of string theory are right. They’re really well motivated; it’s not as if they aren’t well motivated. But it was strongly hyped. And I guess I was against the hype, not the theory. It’s not even a theory. It’s unfair to evolution to call string theory a theory. It’s not a theory. A theory is something that has been tested robustly by experiment and it’s unfair to evolution to call it a theory. I said that many years ago and Brian Greene used to get mad at me, but now he agrees with me. But I think the point is that it’s fascinating and we’re studying it, it just hasn’t had any great successes in terms of demonstrating that it can help us understand the universe. Maybe it will one day. And, as I say, some of my best students have become string theorists, I just wouldn’t want my daughter to marry one. No, just kidding. LK: No, there’s no evidence at all, and it’s very disconcerting to many people, because … Actually, many of us thought, I thought – another example of being wrong – I thought supersymmetry would be seen before the Higgs. It was easier, in principle, to be seen at the Large Hadron Collider. So the fact that it hasn’t been seen is telling. Now, what happens when the Large Hadron Collider turns on again next year will be quite important. Now I’d say that there’s more evidence that supersymmetry might be correct after the discovery of gravitational waves from the big bang, because the scale that’s picked out is the scale of grand unification which is picked out if supersymmetry is part of things. So, it gives me maybe a little more confidence that supersymmetry may be seen, but it’s kind of remarkable that it’s all working out at that scale. But if supersymmetry isn’t seen at the Large Hadron Collider, then we know that we’re missing something important. And it’s a nightmare scenario. If only the Higgs is seen, in some sense, it’s a nightmare scenario, because it doesn’t tell us what is happening. AJ: Well, let’s discuss the film for a few minutes. One thing I’m curious about, and this is probably something you address in the film, but what motivated you to go from kind of the straight just “here’s the facts” science to really being an advocate for atheism, if that’s not overstating it. LK: I’m not an advocate for atheism; I’m an advocate for science, and that I’ve always been, so there’s nothing new about that. What I am is … By being an advocate for science I’m asking people to be willing to accept the reality, the empirically reality of the universe, the evidence. Having their beliefs conform to evidence, rather than the other way around. And, naturally, that implies – since there is no evidence of purpose to the universe – that implies that the tenets of organized religion in the world are not consistent with science. And one should be willing and upfront to say that. I think that by pretending there are some things which are not subject to questioning, we do everyone a disservice. And so, I think the point, what really got me involved in it was, again, in Ohio, right here, in Columbus, where this movie is. I got involved in the Board of Education here in Ohio was trying to essentially get rid of the teaching of evolution in schools and the biologists weren’t speaking up and I had a public pulpit, so I spoke up, and it got me involved and I came here to a big even with the school board for 1,500 people, me and another scientist debating these two nudnicks from the Discovery Institute. And that kind of got me, just protecting science from religious dogmatism, that sort of established that. And once that happened, I’ve been fighting that fight. And I’m against religious dogmatism. It’s not as if I’m out to be an advocate for anything. Except, atheism is just open questioning. It’s not a belief system. It’s just saying you don’t accept things without evidence or good reason for accepting them and that you allow your beliefs to change. As you pointed out, being wrong is really a central part of science. It’s not a central part of religion, where you assume the answers before you ask the questions, and that does a disservice to thinking and action. And if you don’t base your public policy on sound empirical evidence, then the public policy is going to be irrational. And we can’t afford that in the modern world. AJ: What is your next project after this? LK: Well, I have a lot of projects. I’m in the middle of scientific papers. I just wrote, what, 2 last week, because of these new discoveries. I’m writing a new book, but I won’t go into that yet, except that it will follow up on A Universe from Nothing, in a different sense, and address more of the question of why we’re here rather than could something come from nothing. Another fundamental question that in some sense is a religious one. And what I want to do, what I’ve done with these books is show that these fundamental questions that have been the basis of theology and philosophy, science is addressing in new ways. And it’s changing what we mean, but that’s okay. That’s okay. It’s called learning. Unlike religions – which come from human imagination – the Universe came from nothing! “In his 2009 book Who Made God: Searching for a Theory of Everything, Christian chemist Edgar Andrews challenges many of the statements made in new atheist writings including my 2007 book God: The Failed Hypothesis. I have placed a point-by-point rebuttal to Andrews’ criticisms on the Internet. Here let me address just a few of his objections relating to proposals for how the universe came from nothing and how complexity arises naturally from simplicity. See also my earlier post “Did the Universe Come from Nothing?”. A designer God cannot be used to explain organized complexity because any God capable of designing anything would have to be complex enough to demand the same kind of explanation in his own right. God presents an infinite regress from which he cannot help us escape. This argument . . . demonstrates that God, though not technically disprovable, is very very improbable indeed (p. 109). The point Dawkins was making is that if William Dembski, Michael Behe, and other proponents of intelligent design are correct in their claim that complexity can only arise from higher complexity, then God would be even more complex and an explanation would then have to be found for his complexity. But Dawkins does not believe for a moment that this is the case. No one has been more eloquent than Richard Dawkins in describing how complexity arises from simplicity in biology, so it is ludicrous to suggest he supports the ID view. I have personally checked with Dawkins and he agrees with my interpretation of his words. Note that when Dawkins says the existence of God is “technically unprovable, he is not disagreeing with the statement made in God: The Failed Hypothesis that God does not exist beyond a reasonable doubt. Of course we cannot disprove the existence of all conceivable gods. However, Andrews does not understand the argument for the non-existence of God. He repeatedly says it is based on the lack of evidence. He misses the whole point. The case is not solely based on the absence of evidence but on the absence of evidence that should be there. The God worshiped by Jews, Christians, and Muslims plays such an active role in the universe and in human life that he should have been detected by now. Andrews also tries to undermine proposals I describe about where the universe and the laws of nature come from, namely, that they came from nothing — from the void. He distinguishes between two kinds of void: Void-zero is “the eternally pre-existent, non-physical framework in which the physical universe began and must, by definition, lie beyond the reach and remit of science.” He says I confuse this with void-one, which “lies entirely within the material universe” and is “a constituent of the cosmos” that is composed of empty space. Andrews is making a metaphysical assumption that this “void-zero” exists in reality. He cannot know that. He is basing that statement on his faith that another world exists, not science which finds no evidence for such a world. He is also making a metaphysical assumption that the laws of nature are something inherent to the universe, part of the “created order” that we scientists discover. He cannot know that either by any credible means. When theists ask, “How can something come from nothing?” they have the burden of defining what they mean by nothing. Assuming they can, then there are two states of existence: something and nothing. The theist then assumes nothing is the more natural state and so the transition nothing-to-something requires an agent, which is what we call God. Now, why should nothing be more natural than something? In natural processes, the transition from simple to complex is spontaneous, that is, not the result of any causal agent as in the phase transitions gas-to-liquid-to-solid. Assuming that, however we define it, nothing is simpler than something, we expect that the natural state of existence to be something rather than nothing–not requiring God. It would take an agent such as God to maintain an eternal state of nothing!